Primary Care: A non-diving certification which teaches you the basic first aid and cardio-pulmonary resuscitation (CPR). This program has no minimum age requirements so is ideal for all family members. Additional skills include an orientation to using an “automated external defibrillator”, providing oxygen and dealing with choking adults. Secondary Care: Build upon your CPR and First Aid skills by learning how to provide secondary care to a patient when the care provided by local emergency services will be delayed. The secondary care module shows you how to assess illnesses, injuries and splint wounds. 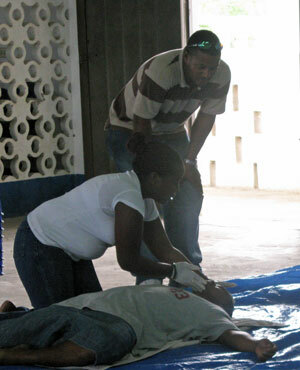 In 1 day, become a competent Emergency First Responder. Care for Children: The Emergency First Response Care for Children course is designed to help you deal with emergencies involving infants and babies. Our staff at Splash Dive Center in Placencia offer EFR training to the local community, the Plantations Emergency Response Team, the Audubon Park Rangers at Cockscomb Wildlife Sanctuary and to the Belizean Tour Guides, so you can be assured we have the experience to provide you with comprehensive training. This course is open to both divers and non-divers and can be completed in ½ to 1 day depending upon the components selected. This certification is a prerequisite for the PADI Rescue Diver course and in just a 1/2 day you can build your confidence and know how to act in the event of an emergency. The PADI EFR is open to all non-divers and family members, including children, everyone benefits!